Since 1980 Sheepscot Valley Health Center has been serving residents of all ages from Coopers Mills and surrounding communities. At our health center, the top priority is the wellbeing of our patients. Our team of professionals works together with our patients to provide a ‘medical home’ and utilize up-to-date knowledge and technology to provide the best care possible. Click hear to learn more and to watch a video: Patient-Centered Medical Home. Our staff includes medical providers, behavioral health consultants, a psychiatric mental health nurse practitioner, as well as clinical and administrative support staff. We provide services based on community needs. This includes offering Adult Psychiatric Medication Management and Behavioral Health services. If outside services are needed, our providers work closely with MaineGeneral Medical Center in Augusta. 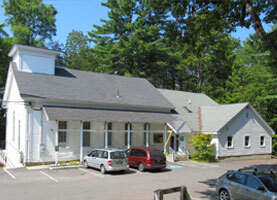 Serving families in Coopers Mills, Jefferson, Somerville, Washington, Whitefield, and Windsor, the Sheepscot Valley Health Center is located in a close-knit community that enjoys a variety of activities including public suppers, seasonal celebrations, and civic events. Hiking, kayaking, swimming and fishing opportunities abound in our scenic region of Maine.